After years of being an icon of the PC revolution, Steve Wozniac talks! 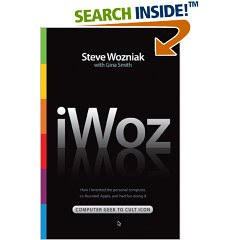 I would say this is a long-awaited account of Steve Wozniac on how it all started. And actually, towards the end of the book, he says that he wrote this book partly to set the record straight. Steve is a SIMPLE COOL NERD! This is the main take away from the book. The book reads as if Steve is sitting with you in a coffee shop and telling you a story. I love the simplicity of the book. He repeats himself every now and then, and asks simple rhetorical questions like "do you believe that"
He uses simple diction, and sounds very excited all the time. He actually goes into detail explaining his original designs - showing how much he actually enjoys this stuff. If you are a CE student, you'll enjoy the book. Steve Wozniac single handedly designed the Apple I & Apple II. Apple company became a huge success directly because of Steve's designs of these 2 machines. Steve was a true whizz kid! he was designing circuits since elementary school! In high school he designed a very nice 8-bit calculator - I could relate to that :-) of course he actually implemented his design and showed it off in science fairs. Steve didn't do any major design work since Apple II. He founded a company that didn't succeed afterwards. Mike Markkula: he was an Intel millionaire who retired in his 30s. This guy truly saw the revolution possible with the Apple II: a cheap micro computer. According to Wozniac, this guy told them they will become a Fortune 500 company, that they will start a whole industry, that people will eventually use the computers for every day tasks - the 2 Steves just thought it was a cool device. Jobs had more of a business sense of the potential, but not like Mike. Mike also was the first real investor in Apple. For example, Mike is the one who insisted that they support Floppy Drives - something very new at the time for PCs. And, Mike is the one who convinced makers of VisiCalc to produce it for the Apple II. Michael "Scotty" Scott: Scotty is a forgotten character in Apple's history. However, he was the CEO who took Apple to the largest IPO since Ford. He was pretty much "fire" in 1981, after he fired about 50% of Apple's engineers thinking they were redundant. That was known as "Black Wednesday". Wozniac seems to really like Scotty. I've never heard of him until this book. Children's Discovery Museum of San Jose my daughters favorite spot in the valley. Ah, Wozniac claims that he's the one behind the Keyword & Monitor idea. He says that he started it with Apple II, and after that all companies imitated it. And, Wozniac also claims to be behind the "whosh" sound in the floppy disks. He says that behind his drivers, the floppy disks made clicking sounds because they were constantly getting stopped and started. He came up with the design to keep them rotating at high speed, and just slowing them down to read. This brilliant design allowed Apple II to have the highest disk access speeds for several years. I can't find evidence for this story though anywhere else but his book. In a nutshell: a very nice, informative, and entertaining book. read it.